Is it too early to panic about Red Sox rotation? 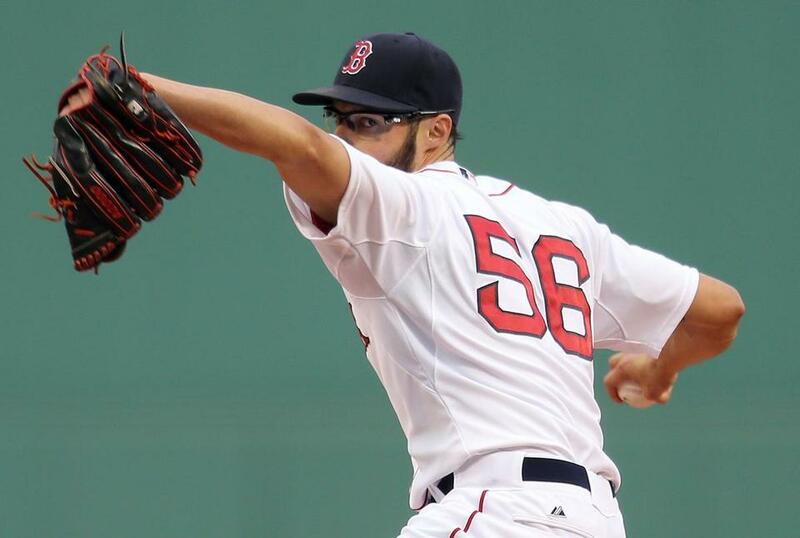 Joe Kelly’s start Monday night against Toronto marked the fourth full cycle through the Red Sox rotation. When does the evidence of a terrible start to the season transform from a small sample size to cause for alarm? That’s the question the Red Sox face about the suspect state of their starting rotation, which arrived at Fenway Park on Monday armed with a 5.75 ERA, worst in the big leagues. The team is averaging 5⅓ innings per start this year, which ranks 24th in the majors, and has endured five outings in which its starter yielded six or more runs, the most in the majors. It would be one thing if those struggles came when the team was awaiting the return of key starters from the disabled list, such as Tampa Bay. But that’s not the case. The five pitchers who have started for the Sox are the same five with whom the Sox constructed their 2015 blueprint. Monday night’s game against the Blue Jays marked the fourth full cycle through the rotation, about 12 percent of the way through the season. Is that too small of a sample, or is that evidence that a roster weakness threatens to swallow the team’s postseason aspirations? To manager John Farrell, it’s a bit early to reach any conclusions. That said, the time to do so isn’t that far off. That suggests the Red Sox have a few more turns through the rotation before the team needs to decide whether to make alterations. The performance of a rotation in the first few weeks doesn’t necessarily project its performance over the entire season. A year ago, for instance, the Nationals emerged from their first 19 games with a 4.57 ERA from its starters, the fifth-worst in baseball. By the end of the season, however, that number was 3.04, the best in the big leagues. Two other teams lowered their starters’ ERA from their first 19 games by at least one run by the end of last season (Diamondbacks and Indians), while six more lowered their starters’ ERA by a half-run or better, including playoff participants Pittsburgh and Baltimore (4.50 ERA through 19 games, 25th in the big leagues; 3.61 for the year, 12th). Do 19 games forecast a season? In 2014, Red Sox catcher Ryan Hanigan helped handle a Rays rotation that stumbled early in the season (4.12 ERA through 19 games, 20th in the majors) but finished with a 3.48 ERA that ranked seventh. To the veteran, less than one-eighth of a schedule does not a season make. “I think after May, eight or nine starts, probably about a third of their starts, you can evaluate where they’re at,” said Hanigan. “As players, we’re thinking about how can we correct it in the next start, but the reality is it’s usually a little bit of a process. So, the Red Sox remain dedicated to trying to fix members of their rotation rather than declaring them broken. Still, there is the possibility that this sample might be a valid barometer of what they are. Exactly half of the teams that ranked in the bottom 10 in rotation ERA through 19 games last year finished the season in the bottom 10. With April nearly in the books, it’s intriguing to note that from 2010-14, the major league rotation ERA for any given month did not deviate by more than 0.19 runs from the ERA for that season. As such, the 4.03 ERA of all big league starters entering Monday’s games likely offers a decent sense of where the Sox need to get to perform at a league-average level. In all likelihood, the average ERA for a starting rotation this year will fall between 3.85 and 4.20. That leaves the Sox with a lot of work to do. They’d have to drop their rotation ERA by 1.55 at the high end of that estimate. A year ago, only the Diamondbacks (who went from a horrendous April ERA of 7.26 to a still-really-bad 4.44) and the Nationals had rotations that made a jump of that magnitude. The Sox continue to view their rotation woes as a small sample, too early to say it represents an insurmountable weakness. But the hourglass is draining. The team’s starters are on the clock to prove they can represent a source of stability — or at least adequacy — and that they can improve drastically on a big league-worst performance to date. How do coaches fare the first time they face Patriots? Should Red Sox try to acquire Alex Gordon? Alex Speier can be reached at alex.speier@globe.com. Follow him on twitter at @alexspeier.